BASKETBALL player Japeth Aguilar will no longer be the flag bearer for the Philippine delegation in the opening ceremonies of the 2014 Asian Games in Incheon, South Korea. World windsurfing champion Gaylord Coveta will take the place of Aguilar in the opening ceremonies set on September 19, according to Philippine Olympic Committee (POC) first vice president Joey Romasanta. In explaining the switch, Romasanta said Gilas players needed the rest in preparation for the Asian Games basketball competitions which will start on September 20, or a day after the opening rites. However, the national cage squad will not be playing until September 23. Gilas, however, is coming off a grueling stint in the Fiba World Cup where the Filipinos won a game against Senegal while losing to world power Argentina and Croatia by only single digits. 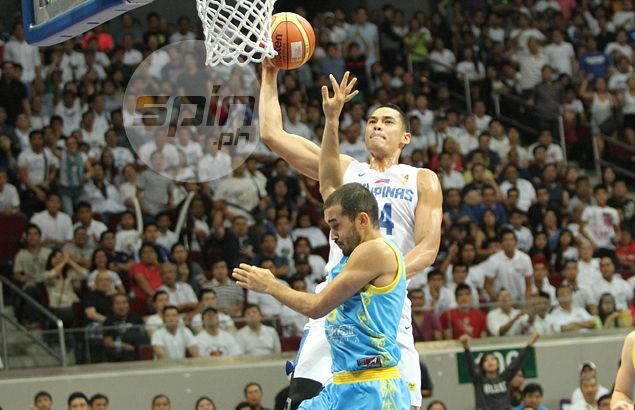 “Ang reason ng Gilas is they need all the rest they can get. Mapapagod daw,” said Romasanta of the last-minute decision. When asked on why the Barangay Ginebra big man had to be pulled out, Gilas team manager Aboy Castro said Aguilar won’t be able to make it to the opening ceremonies since the team will fly to Incheon on September 20. “Team is traveling to Incheon on September 20,” Castro said in an SMS message. Gilas, which reconvenes for practice on Saturday, will open Group E hostilities against the top-ranked team in Group B of the qualifiers on September 23 before facing Asian champion Iran on September 25. The top two teams in the four groups in the preliminaries will advance to the round-robin quarterfinals.